Lynda Barry's new book may present a problem for the librarians smart enough to purchase it. Barry classifies her book as "autobifictionalography." Should libraries start a new section? Maybe. It wouldn't be the only book there. No fewer than four semi-autobiographical books about growing up, all by women cartoonists, have appeared or will appear this fall. TIME.comix has dedicated each week in October to covering a different volume. This third installment examines Barry's "One Hundred Demons" (Sasquatch Books; 224pp HC; $24.95), the first work of (nearly) non-fiction by the veteran alternative weekly cartoonist. Whatever she wants to call it, Barry's book creates a poignant mix of what makes our lives both comical and sad. The titular "one hundred demons" are actually seventeen vignettes from the author's life, mostly from her childhood. Treating the book as something of a Zen exercise, Barry has claimed that, with no determined direction, each piece began as a word or phrase on a notecard. The somewhat random subjects of each story bear this out: Dancing, Hate, San Francisco, Dogs, Girlness, etc. "Dancing," for instance, tells of Barry's childhood enthusiasm for hula dancing. With fantastic powers of memory (or perhaps imagination) Barry recreates the near-hallucinatory, intensely-observed world of childhood. The hula teacher is a "middle-aged white lady who was obsessed with Hawaii. She always had a plastic orchid in her hair..." You could read "One Hundred Demons" just for the pleasure of remembering playing kickball in the street, or the way other people's houses smelled, or clutching your favorite teddy bear. 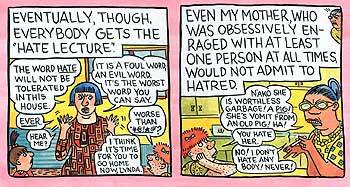 A page on "Hate" from Lynda Barry's "One Hundred Demons"
Fortunately, nostalgia isn't all you get from this book. In the best pieces, Barry explores wider themes, most often the loss of childhood innocence. The "Dancing" piece, for example, changes when the teenage Lynda learns that she dances like a spaz. "All of sudden dancing got hard," she writes, showing herself caught between the desire for and dread of carefree dancing. Told in a vaguely chronological order, each vignette explores a different aspect of the change from childhood to the alienated world of the teenager. Particularly vivid is Barry's portrait of her mother, a Filipino immigrant with a nasty streak. The story titled, "The Aswang," ostensibly about a legendary Filipino monster, turns into a fascinating examination of how dysfunctional mother-daughter relationships can turn lead to loving grandmother-granddaughter relationships. While most of the stories hew closely to the coming-of-age theme, Barry occasionally slips in a piece, like the one about the 2000 presidential election fiasco, that doesn't really jibe with the rest of the book. Despite its dismal threads of crushed self-esteem, anxiety and loneliness, "One Hundred Demons" is one of the prettiest books I have seen. Barry has a charming, appropriately childish cartooning style that belies the amount of work she must put into each page. Bright watercolors fill in the brush lines and each vignette gets a carefully collaged title page, often containing artifacts from the story thereafter. Even when you close the book, the colored pages create a rainbow around the edge. Perfect for comix novices, the easy-to-read layout has just two big panels on each wide page. Barry uses the top half of each panel for her running commentary with the bottom part usually containing an illustrative dialogue exchange. 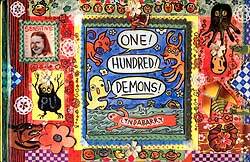 Using acutely-observed humor to explore the pain of growing up, Lynda Barry's "One Hundred Demons" masterfully captures that period in all our lives when we begin to feel alone in the world. Fictional or not, Barry's demons have the kind of authenticity that make them totally real.